A common tool has never been so epic. To celebrate the release of the (real) TF2 Engineer Update (and to spite drift-racers the world over), there are 100 super special golden wrenches being given away in-game. Just a simple recolor of his melee weapon? Well not quite, see this doesn't just kill your enemies, it turns them into freakin' golden statues. Yes, that is quite awesome. How do you get one of these King Midas-infused tools? Well what better way than through crafting! However, it is a random chance to unlock this during any crafting blueprint. You smelting some weapons into scrap? Oops, you just made a golden wrench by accident. The chance of this however is quite low (of course) so get your Diablo finger warmed up and start clicking. Oh, and to those who instantly think they're clever by realizing they can just smelt metal then smelt back to scrap back and forth, it's already been disabled, although only during the Engineer's Update period. Time to clear out your inventories and test your luck, will you be setting people into an eternity of golden shame? Smelt and find out. 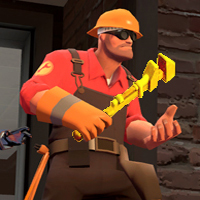 Every time a golden wrench is found, it is announced throughout the entire game to all currently active players, so it's kind of a big deal. Also, every time 25 of these wrenches are found, more info on the Engineer Update will be released, so stay tuned. Check out the official TF2 Golden Wrench Blog to see how many of them are left, or bask in the aura of greatness that is the list of lucky pioneers.